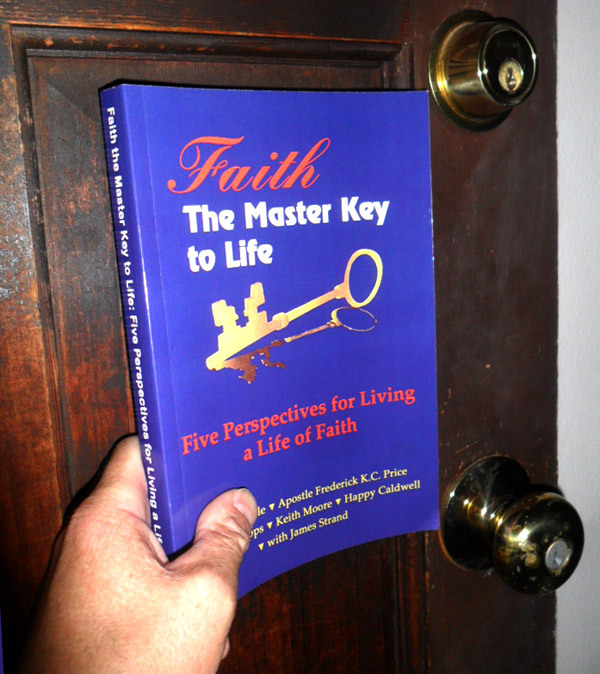 The print version of Faith the Master Key to Life: Five Perspectives for Living a Life of Faith by Jerry Savelle, Apostle Frederick K.C. Price, Charles Capps, Keith Moore and Happy Caldwell with James Strand, Editor is now available. The Buy Now button for one copy or multiple copies is below. For most of you who are reading this who live in the contiguous 48 states of the U.S you can use the link below to order your books. There are also built in discounts for multiple book orders. These books are not yet available in bookstores. They will be available soon, but for now this will be the best way to order your books. You can expect to receive your books in 7 to 10 days by UPS. Please use this link to buy your books if you are living outside the contiguous U.S. states. This includes Hawaii, Alaska, U.S. territories or and other countries. It is finished were the last words Jesus Christ spoke before he died. Jesus finished the job on earth and fulfilled his purpose for being born by giving his life so that we might be reconciled to God. When we finish an assignment from God we are given God’s grace to complete it because of what Jesus Christ finished on the cross. He died for your sins and my sins so that we would be entitled to a life without limits. He died but he did not stay in the tomb. The power of God raised him from the dead. He triumphed over all evil, sin, sickness, disease, poverty, loneliness and death. He conquered death and hell so that you could believe he was the son of God and become born again. He died so that you could live by faith and experience God’s best for your life. He died so that you could live your life by the same power that raised him from the dead. When you are born again your cold, dead heart is transformed by faith into a new heart. The old sin-riddled heart of stone is purified and made new. You were forgiven of all your transgression against God and everything becomes new. By faith you were born into the family of God and entitled to all the rights and privileges that belong to Jesus. He died so that you could share in his eternal inheritance. He promised those who have faith in him an abundant life. He promises you will now have the opportunity to explore the unlimited riches of his mercy and forgiveness forever throughout the ages to come. You receive all this by faith. Faith is the master key that unlocks all promises of God and allows you to enter into throne room to receive his grace in time of need. While I am in no way comparing the finishing of this book to what Jesus did on the cross. I want to point out that Jesus calls each of us to pursue different tasks and challenges in our life. Finishing the course that is set before you is important. It was over 6 years ago that I attended the Agape Church Faith conference hosted by Pastors Jeanne and Happy Caldwell. The speakers were Jerry Savelle, Charles Capps, Apostle Frederick K.C. Price and Keith Moore. God spoke to my heart after the meetings to take the conference CDs and create this book. I took the idea to Pastor Happy Caldwell and he heartily agreed it would be a blessing to many people all around the world who were not there. I believe God has given me the grace to create this book so that you can receive and enjoy the blessings of God these men of faith in this book preached and taught about. The meeting has been over for some time, but for those you who have spiritual ears to hear, the word of God can still come alive to you from the pages of this book. Agape Church had held Spring Campmeetings for many years. The Campmeeting had its origins in the pioneer days of the English Colonies before they became the United States of America. This was a time before communications were instantaneous around the world. Preachers would travel from city to city on horseback to minister to the pioneers throughout the colonies. Occasionally, several preachers would get together and hold meetings out in the countryside. Word of mouth spread the news about these revival meetings. People would bring their families in horse-drawn wagons from miles around and campout for several days and listen to these preachers. preach all day long. One preacher would preach for a few hours and then another one would take his place. These revivals helped change the faith and destiny of the early colonies. They helped unite the colonies in what would become a Christian nation, the United States of America. Many souls would be saved during these Campmeetings. Campmeetings were an important part of our history in the early days of the United States. The same spirit of these old Campmeetings where people would come from miles around to hear preachers preach and teach the word of God was at the Agape Church Faith Conference. The same power of God that brought revival to the early settlers of our country was there to bring life and transformation to those who had ears to hear and put into practices what was being taught. I was inspired to take the transcripts of these meetings and edit these messages into a book that would record for others the message of faith that was preached there. What was so unique about this meeting was that these ministers were not novices. They had all been faithful to preach the message of faith and hope in Jesus Christ for many years. They were all successful ministers with proven track records of success. Their messages all dovetailed together into a seamless, timeless classic message about what the Bible kind of faith was all about. They taught scripture after scripture on the topic of faith and how to receive the blessing of faith in your life. Without faith you cannot please God. The Bible says the just shall live by faith. How do you live by faith? This book tells you how. 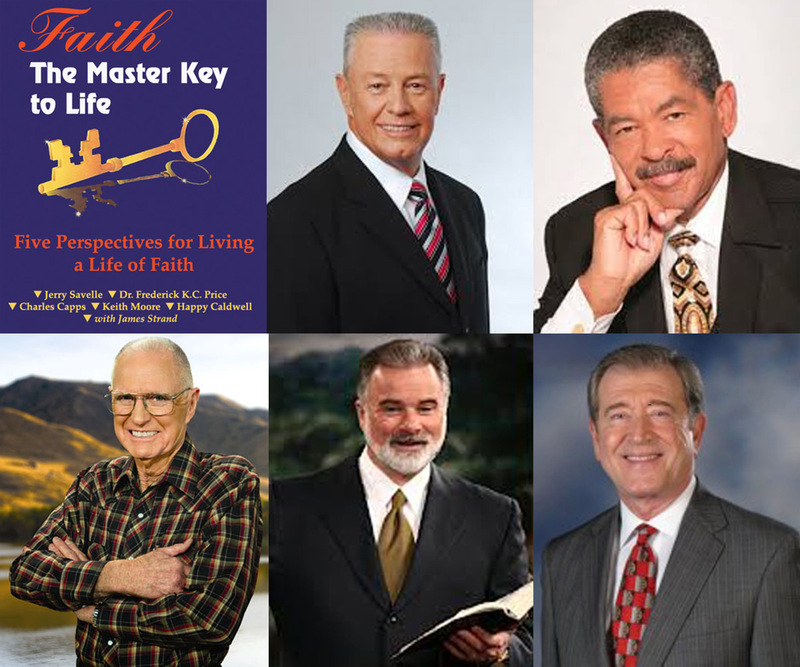 You will hear personal stories from each one of these ministers that will bring the word of God and the message of faith alive to your heart. You will learn and know how you can apply the principles of faith to your life so that you can receive the promises and blessing of God for yourself and those you love. Order your copies today! Faith the Master Key to Life: Five Perspectives for Living a Life of Faith by Jerry Savelle, Apostle Frederick K.C. Price, Charles Capps, Keith Moore and Happy Caldwell with James Strand, Editor. Thank you for reading our blog stories, printed books and eBooks!